Where are you from? What did you study? DEEPSHOWER: My hometown is in Daegu. I lived there until elementary school and moved to Seoul. I didn’t go to university, but before making music, I was into sports, especially kickboxing. When did you begin producing music? DEEPSHOWER: I’ve studied music around five or six years. I had music lessons for a year, and afterwards, learned on my own. I made my debut as “Deepshower” two to three years ago. Was it something you always wanted to do? How did you start? DEEPSHOWER: In the beginning I wanted to be a rapper. However, I was quite shy and was not used to perform on stages. So then I focused on making hip-hop beats for rappers instead. DEEPSHOWER: Before Deepshower, I was producing under a different name. 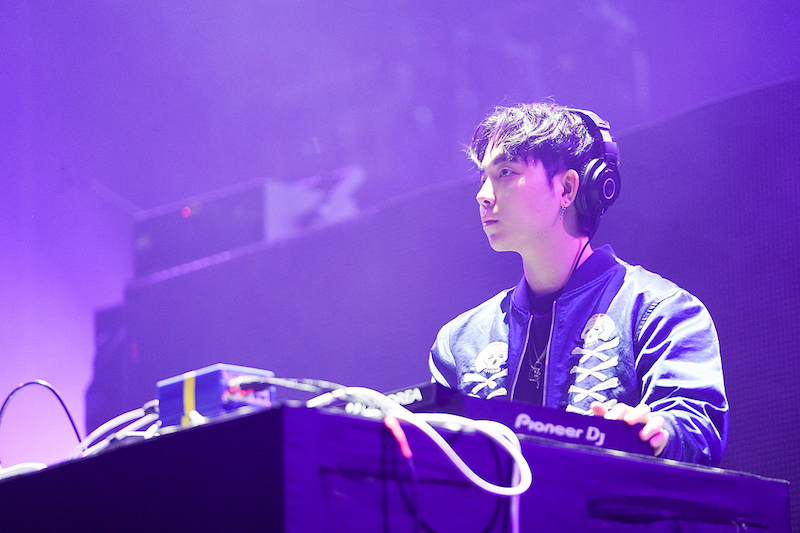 At that time, I was focusing on [the] dubstep and trap genre. However, later on, I felt that I needed a change...so I turned to warmer and softer music, and found deep house music. I wanted to use the word "deep" as a message to make deeper sounds to audiences along with the term 쏟아내다 ssudanaeda, [which means] to let it out or to shout out. So eventually, Deepshower was created. Who was the first person you showed your music to? What was the reaction? DEEPSHOWER: It wasn’t anyone particular because I uploaded my first songs on SoundCloud. In the beginning, there were barely any listens. Maybe around 10 listens? So, it was hard for me to receive feedback. Later on, as I continued to upload more songs online, it began to receive attention. Some DJ's told me that they wanted to play my songs. How would you describe your own music? Is there a genre that it fits into? DEEPSHOWER: I officially started making music because of the deep house genre. Other...music producers like Disclosure, FKJ, and Darius were my biggest inspirations into making the music I want. I would consider my music genre as chill house or chill out, since my aim is to make calm music. How long does it usually take you to produce a song? DEEPSHOWER: I don’t take my time producing music. Since this is a creative job I have to do, I try not to stress too much about it otherwise I can’t make the music I want. I wait until I find the urge or the passion to create, so I spend my time watching a lot of movies and listening to music. Right when that passion kicks in, I can make a song under a day or two. Can you produce a song anywhere or do you need to be in your studio? DEEPSHOWER: When I work, I can’t let anyone in my studio. [It's] only me. Your song with G.Soul was a hit. What was creating that track like? DEEPSHOWER: The song Found You has a personal story. Originally I wrote this song while thinking of summer. There’s this artist I particularly like called Shift K3Y. I listened to his music and watched summer related contents to write the song. Also, I’ve been a huge fan of G.Soul for a long time. In Korea, you wouldn’t be able to hear singing vocals on house music, but I was surprised when I heard G.Soul’s songs because he sang along with the house genre. That’s when I really wanted to work with him so I sent him an email asking to work together. It was after two months that I finally got his reply. Do you think it’s easy for smaller producers here to work with big labels? DEEPSHOWER: It is better than before. Getting recognition as a music producer is still difficult since the singer tends to stand out the most. That’s why I am making an album under my own name. People do still perceive the life of a music producer as just someone who writes songs for singers but ...without the work of these producers, we wouldn’t be able to hear good music. I wish that people would see the profession of music producers as something cool. Why did you start DJing? When and where was your first set? DEEPSHOWER: I was at a lounge in Gangnam two years ago. At that time, I had absolutely no interest in deejaying but a friend of mine was hosting a launch party and asked me to deejay. I was pretty much dragged by that friend to deejay. Thinking back, it was fun, and after that I slowly continued deejaying. These days you host parties at Soap. What do you like so much about that venue? DEEPSHOWER: Well, the name sounds good: Soap and shower from Deepshower! Even the smoking area in that club is called “Smoking shower." What’s good about Itaewon clubs is that everything’s so casual there—the people and the environment. Soap in general fits me very well. Not too long ago, you opened up for HONNE when they played in Seoul. What was that like? DEEPSHOWER: I remember feeling extremely nervous. I heard that HONNE played for three days and the first day had over 2,000 audience members in the venue. When I went up to play, I saw nothing but tiny heads everywhere and my hands were shaking pretty bad. Even though I was nervous, I did enjoy that moment. It was an honor playing with HONNE. What’s your dream venue to play a set in? DEEPSHOWER: Before I wanted to play in really big stages like Tomorrowland or UMF. Recently I wanted to play in fashion shows. My favorite brand is Gucci so it would be awesome to play in a Gucci show! DEEPSHOWER: I have an EP in-the-making so please watch out for that! I’ve been working on it about six months and it features artists like Penomeco, jeebanoff, George, JB from Got7, Min from missA and more! I will continue to make music and deejaying. Hopefully I will have a time where I will be widely recognized.